Having just watched what one can only call a crazy game, both United’s defence and the abysmal refereeing were just totally unacceptable. Of course, if you are a neutral, it was fascinating viewing, but for die-hard United fans, it had highs and lows like I don’t remember in a very long time. Falcao’s cross for the first goal was sublime, Di Maria’s goal was just pure magic, and when Falcao hit the bar in the second half, I felt it was only a matter of time before we scored another beautiful goal and Herrera duly hit the back of the net to make it 1-3. The first goal by the home side was a well-taken effort, but the defending by Rafael and Evans was nothing short of abysmal. Then in the second half it was hard to watch what unfolded before our eyes. Of course the quality of Clattenburg’s refereeing was a disgrace – how he didn’t give the foul on Rafael is baffling, but how stupid is Rafael? He’s always been a liability and again showed today that he’s just not good enough to play at this level. So 3-2, and for a few seconds I still felt confident we would pick up 3 points but the defence just continued to capitulate and we witnessed a complete turnaround by the home team against a side of superstars. I didn’t understand the substitutions – RVP had done nothing since he headed us into the lead early on, whilst Di Maria and Falcao always looked likely to cause damage to the opposition. And why was Luke Shaw on the bench? Did he buy Rojo as a centre back or a left back? Why isn’t Rojo playing in the middle with Blackett and Shaw on the left? I don’t quite get his thinking. We have a wealth of attacking talent, and it’s fantastic and exciting to watch, but if we cannot defend, we will see many more results like today. Van Gaal needs to work much harder in training with his defenders and also see what he can recruit in January to allow the brilliance of Di Maria, Falcao et al to flourish, otherwise another finish outside of the top 4 will be the reality come May. The refereeing was totally unacceptable today, but that alone cannot be used as the excuse for completely falling apart in that second half spell, and whilst LVG has got rid of many players who were not good enough, there’s no doubt that Smalling, Evans and Rafael are also not good enough, and I for one think he made a mistake not allowing Smalling to go to Arsenal as part of the Vermaelan deal, as he would have most definitely strengthened a very poor defensive unit. 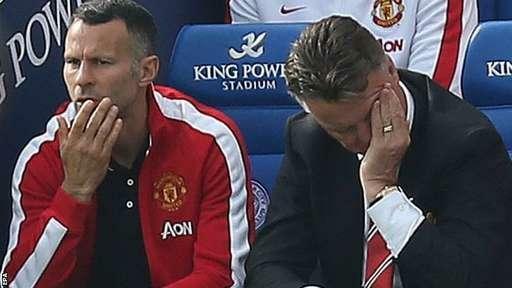 Get it together LVG – it’s great to watch going forward but suicidal at the back. Does Louis Know What He’s Doing?